Climate change is already beginning to transform life on Earth. Around the globe, seasons are shifting, temperatures are climbing and sea levels are rising. 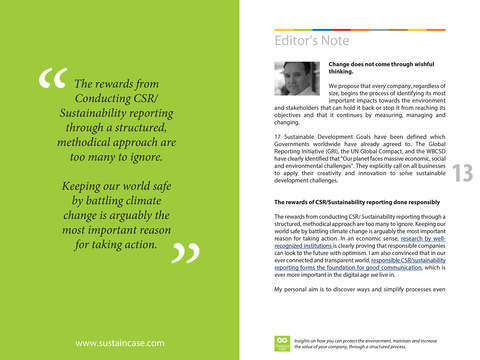 Expectations that companies’ long-term profitability should go hand-in-hand with protecting the environment are gaining ground and are only set to increase and intensify, as the need to move to a truly sustainable global economy is understood by companies’ financiers, customers and other stakeholders. 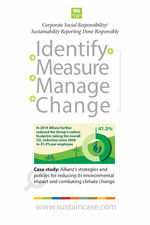 Among other key material issues, global warming and climate change, as well as the company’s environmental footprint, stand out as of crucial significance for Allianz and its broad spectrum of stakeholders. 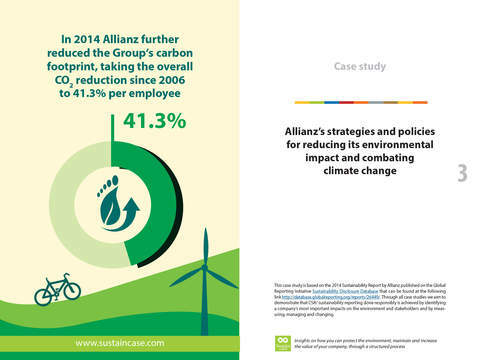 Prioritizing these issues, Allianz took action – after measuring and setting targets – on reducing its carbon footprint and energy consumption, as well as on engaging its employees and raising their awareness of climate change as a key issue for its business. 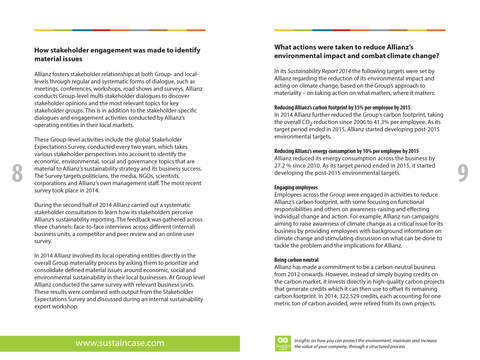 Additional policies and measures included furthering the integration of sustainability in products and services and reducing total waste production.